On Monday the 10th of September, trading on the euro closed up. The correction against Friday worked out. The price has recovered to 1.1616. It could go up higher, but was limited by a decrease in the exchange rate of the euro/pound cross pair. 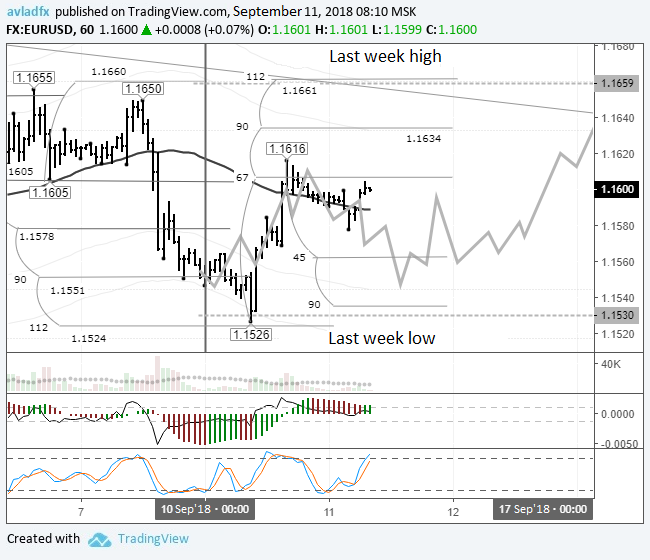 The British pound received support against the major currencies on the news that the EU and UK have made progress in the Brexit negotiations. EU representative Michel Barnier said that within the next 6-8 weeks it is likely that they will prepare a trade agreement, which will take effect once the UK leaves the EU. 11:30 UK: ILO unemployment rate (3M) (Jul), claimant count change (Aug), average earnings (3Mo/Yr) (Jul). 12:00 Eurozone: ZEW survey – economic sentiment (Sep). 12:00 Germany: ZEW survey – economic sentiment (Sep). 15:15 Canada: housing starts s.a (YoY) (Sep 7). My expectations on Monday proved true. The price is sticking to the weekly forecast. As the Asian low was updated before the euro strengthened, today I wanted to make a separate scenario for growth to 1.1634. I left it as is. The economic calendar on Tuesday is scant, so we could end up in a narrow range today. The support is at 1.1562 (45th degree).